We started drinking smoothies again every day during the Daniel Fast, and we forgot how much we LOVE it! I highly encourage everyone to drink at least one green drink a day….whether it’s a smoothie, you’re juicing, or it’s a greens powder. -Start with leafy greens. Be sure to mix it up & don’t use the same types of greens every day. I use kale, spinach, arugula (very strong taste), bok choy, swiss chard, etc. I typically but Super Greens mix,Power Greens Mix, or Protein Greens mix so I can change it up. I fill the container 3/4 of the way full of greens (shred it so it takes up less room). - LiveFit Superfood Powder contains things like broccoli, tomatoes, beets, hemp/chia, & some other things I typically wouldn’t put in my smoothies in their whole food form, but you can’t even taste it. I also like that is has some protein. I usually do 3-4 scoops. I found it at Costco originally, but I’ve heard some people say they found it at Wal-Mart. -Collagen. SO MANY BENEFITS! Gut health, skin elasticity, supports healthy joints. Give me alllll the collagen! Sometimes I drink it plain or mixed with my AdvoGreens/Reds powder, but sometimes I’ll drop it in my smoothie. -Choose your frozen berries. Sometimes I do wild blueberries (pwerful for brain health), sometimes strawberries, and sometimes these acai packs. Blackberries/raspberries are great too…they are just “seedy.” I try to mix it up, but only do less than a cupped handful of whatever I choose. They are all organic and I found them at Costco & Kroger. **side note: you may want to add 1/3 of a banana if you’re new to smoothies and the greens are a little much for you. -Choose your healthy fat. I always pick between 1/3 or 1/2 of an avocado (typically what I choose), liquid organic coconut oil, or almond butter (where the only ingredient is almonds). Be mindful of serving size with healthy fats, but don’t skip them. Your brain is made up of over 80% fat, so it needs them! -Dulse flakes. (Check out all the benefits here!) SUPER beneficial! - I don’t blend until it’s totally smooth. It has just enough texture that I can somewhat “chew” it, which actually releases digestive enzymes to help you better absorb the nutrients. Jonathan makes smoothies almost daily too. His taste WAY better than mine, but they also have way more calories (which is fine for him). I’ve acquired a taste to mine & actually crave them. They are SO nutritious! We started piloting a program back in the summer, and the results have been IN-CRED-IBLE. I followed this for about 5 months, and I actually LOST inches during the holidays this year. Normally I maintain pretty well because our products are that good,but this year I actually lost. I still enjoyed treats & Christmas cookies and my holiday faves, but this program helped me eat smaller portions and revved up my metabolism so I’m a fat burning machine. I also love the lifestyle guide that comes with it (red light eating is GENIUS and scientifically backed and proven). I am SUPER impressed. I mean, I can fit in my size 4 pageant dress that I wore 18 YEARS ago (now after having 3 babies) if that tells ya anything about it! (**may or may not have been secretly hoping Jonathan wouldn’t wake up when I was taking these! hahhaa!!! he was totally asleep in the bed behind me.) And the best part is that I feel so.so.GOOD!!! I also have a FB page where I share the newest programs and some fun tips, so you’re more than welcome to request to join. Lots of great info & I share resources/record live videos in there too. Slim & Trim: Live Lean in 2019. Here are a few of my friends who have ROCKED it out! Like, legit real life friends. There are tons of freebies that end tonight,like the free shaker cup featured on Shark Tank- it is SO cool! ), FREE shipping when you order the Slim + Trim 28, & it’s the last chance to enter into the $45,000 transformation contest. Yes, I am for real. We really want someone on OUR team to win that first place prize of $25,000 CASH and free Spark for an entire year, so if you want us to coach you & to go for it, let me know ASAP! Gotta get you entered by tonight! Here are the price breakdowns per day. Don’t forget it includes one meal a day, your vitamins, and your afternoon rocket fuel BioCharge/Slim combo. **If you think you’ll share with others and want to earn income for referrals, or want to get to the deepest discount (40%), you definitely want to become a distributor. I talk to so many people on a regular basis who are ready for breakthrough in one or more areas of their life, but they are unwilling to “give up to go up.” There aren’t many things in life where we can advance and see growth without putting in some intentional effort. I know there have been a few places in our life lately where I have just felt “stuck.” Ya know what I mean? Just not where we want to be, or where I know we should be. Everything else is in place and we are positioned for advancement in these areas, so I knew it has to be something I am doing. And the best place to look when you’re in that position is in the mirror and then UP! As I have been fasting and praying for a solution and BREAKTHROUGH, I heard a clear “give up to go up.” And I don’t mean “give up” as in quit. I mean “give up” as in surrender, sacrifice, & stretch. Surrender. First and foremost, we are called to surrender our lives to the Lord. Surrender means cease resistance and submit willingly to authority. If you’ve never done that and don’t know what it means or what it looks like in your life, I’d love for you to e-mail me & have a personal conversation with you about it. Essentially, it’s admitting you’re a sinner (Romans 3:23), believing that God sent his Son to die for us because of our sin (Romans 5:8, Romans 6:23, John 3:16), that He rose again 3 days later and the blood He shed for us creates an opportunity for us to have eternal salvation. It’s as simple as confessing and repenting (turning away) of sin and professing that Jesus is Lord (Romans 10:9, 10:13). So that’s the first step. SURRENDER. Not my will, but thine be done. Lord, help me to truly MEAN that. Sacrifice. Sometimes we have big dreams, big goals, and big wishes…but they will never become reality because we aren’t willing to sacrifice anything. Not sacrifice our time. Our money. Our favorite tv show. Our hobbies. Our pride. Our entertainment. Our social media. Certain foods. I believe we honor God with our first fruits. We honor Him with the first fruits of our finances in the form of tithing. (My personal opinion based on Scripture is10% given to our church. Anything you give above that is gifts & offerings.) We honor Him with the first fruits of our time through prayer/quiet time in the morning and attending church at the first of each week. We honor God physically by beginning each year with a fast. 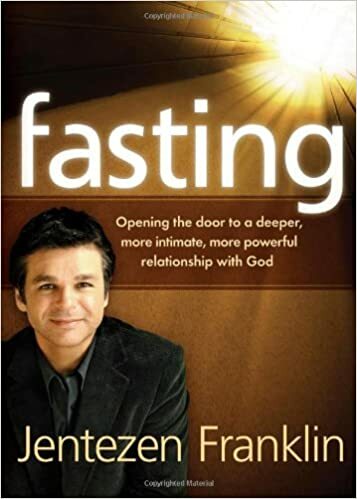 If you’re new to fasting, I recommend listening to Jentezen Franklin’s book called Fasting. Total game changer for my spiritual life and walk with the Lord, and this helped me understand the WHY and the HOW TO. Jonathan and I are currently doing a pretty strict Daniel Fast and I’m limiting social media time. (The thing I miss the most is SPARK! Well, caffeine in general.) We are avoiding bread, dairy, sugar, meat, anything processed, and caffeine. But more important than those sacrifices, we are in a season of intense prayer to show a sacrifice of our time. No tv or movies. Limited screen time.I know it sounds intense, but we want to show the Lord we are serious about serving Him, seeking His will, & being more fruitful and Christlike. Jesus fasted and prayed, so we fast and pray. Side note: I saw a car the other day with a bumpers sticker with two of the kiddos names & little banners on the back, and then another bumper sticker that said “I’d rather be ___________.” (It was a hobby.) It might have been a joke or just a funny bumper sticker, but it made me stop and think. From an outside perspective, based on my calendar, my checkbook, my social media accounts, my thoughts, and where my heart is, is it super clear and evident what is most important in my life?? Would an outsider looking in be able to tell what I am most passionate about? And how about the people closest to me? Do they have any doubts as to where they fall? Stretch. This is where is gets fun. I believe God calls us to be stretched and learn to operate outside of our comfort zone. This is where He can really show up. Being outside of our comfort zone means choosing faith over fear because it requires dependence on the Lord rather than our own strengths & abilities. It allows Him to pair his super with our natural for a supernatural result that could only be explained as “from God.” It feels so hard & scary, but I can say that I have learned to be more comfortable being uncomfortable. I am working on being radically obedient in 2019 (which is really just Biblical obedience, but in today’s society, Biblical obedience seems radical). This means often doing, saying, praying things that feel intimidating & too big for me. I believe the enemy would like nothing more than to keep us shackled and bound by our own fear. Fear of rejection, of the outcome, of our own inability. But when we choose to allow the Lord to stretch us and operate in FAITH, out of obedience, the Lord shows upon our behalf in such a cool way. You know…that abundant way. Maybe your 2018 went exactly like you wanted. Maybe your life is exactly where you’d hoped and you’re completely satisfied in all of your relationships, with your finances, in your spiritual life, with your health, in your business. My prayer is that you’re content, but never complacent. And if you just so happen to be in a place like me where you are ready to see breakthrough in one or more of those areas, I hope you’ll ask God where you can surrender, sacrifice,and stretch to see more FRUITS and more FAVOR and more BLESSINGS in 2019. As most of you know, I am super passionate about health, wellness, and disease prevention. The Lord recently opened the door for me to become the group leader of our local Healing Strong chapter. Although I don’t have much room on my plate or extra time in my schedule, Jonathan and I both felt this was to be a “YES” for us. Healing Strong is where my holistic health journey began nearly 5 years ago & where I have learned so much of what I know about “clean living.” I love the mission, the vision, the support, the education piece, the community, and most importantly that it is founded on Christ and a faith-based non-profit/ministry. It really is a perfect fit for me. If someone you know is on a healing journey or interested in prevention, it’s worth checking to find a local group close to you. You will not regret it! It was so powerful! The entire event was executed with such excellence. They provided awesome goody bags, a delicious organic lunch, and sevel yummy healthy snacks like smoked salmon, homemade nut mixes, and juices. The name of the Lord was lifted up, & I believe people left empowered to take control of their health. - in 1900, only 5% of the population had cancer. In 2016, that number rose to 40%. - United States had over 600,000 cancer related deaths last year and 1.7 million diagnosed. - The most consumed “vegetables” in America are french fries, onion rings, and ketchup. -nutrition should be frontline therapy in cancer patients but unfortunately it's rarely discussed. Most oncologists have zero training in nutrition. - The average American consumes 150 pounds of refined sugar a year. - every cell in your body is eavesdropping on your thoughts. It matters what you think. - you cannot be grateful and unhappy at the same time. - your genetics make up a very small portion of your chances for been diagnosed with cancer. Your epigenetics play a much bigger role. - ballroom dancing lowers risk of Alzheimer’s disease by 73%. -1 out of every 3 Americans will get cancer. Only 1 out of every 7active Americans will get cancer. - our toxins are expelled through our urine, feces, liver, and sweat. Stop using anti-perspirant and allow your body to sweat! - What factors most affect our overall health and chances for cancer? Exercise, detox, nutrition, microbiome, attitude, & energy. Small portion is genetics. - as a nation, we are eating TOO much, TOO often, & the WRONG food! - The typical Western diet is fertilizer for cancer cells. - 92% of Americans don’t even get the RDA of vitamins, which is an extremely low standard for nutrition. - Our soil has 80% less minerals than it did in earlier years because of soil degradation. - during the first eight hours of fasting, the body goes into the glycogen stores. The next four hours it starts burning fat. you want to shoot for going past 12 hours (14-16) because the body starts burning fat past 12 hours. - 10 PM to 2 AM is when the body ideally heals. You want to be asleep during this time. - if fasting stresses you out, don’t do it. It is more important to not be overwhelmed with stress, which has extremely negative impact on your overall health. - is it fasting from food or is it FEAST with Jesus? -you can inherit up to three generations of trauma. - know your purpose: your what, what for, your why, and your how. - They shared some really interesting connections Between emotional hurts and various types of cancer. Example, prostate cancer can often be linked to worrying about future generations or the loss of a child. And breast cancer, right side is many times as tide to father issues in the left side is tied to maternal issues. - unforgiveness, bitterness, guilt, etc can often manifest in the form of health issues. - The fuel you put into your body affects the way that it runs￼. You wouldn't put sugar in your fuel tank and expect it to run. And then when it breaks down, you don't just completely remove the fuel tank, right? -You are ridiculously in control of your health and your LIFE!! -you have options. Cancer does not have to be a death sentence. Most cancers are slow growing and you have time to research and make a decision. -We all have cancer cells. We are either feeding or starving them based on our lifestyle choices. Our bodies should be able to combat unhealthy cancer cells. - there is healing power in MUSIC! - laughter really is medicine for the soul and adds years to your life. - if you’re not already juicing, start ASAP. Whether you are on a healing journey, standing in the gap for a loved one who is, or focused on prevention and taking the best possible care of your family (like me), you’ll want to pay the $25 to get access to this recording of the day. And take notes!! I cannot stand to watch ONE MORE PERSON lose their life too soon to this disease, & I hope you’ll join me in helping spread awareness.